Thermal paste performance depends on many factors such as application method and quality, bond-line thickness, contact surface and quality, total mounting pressure and pressure distribution, heat load or heatsink type. Therefore, comparison results can generally vary from setup to setup. Moreover, particular setups with their respective properties such as contact quality between CPU IHS (integrated heatspreader) and cooler base (gap sizes, pressure concentration) or mounting pressure may favour one thermal compound over the other. When comparing high-end pastes such as NT-H1 and NT-H2 where the differences can be small on some setups, it is also crucial to strictly control all parameters and tolerances because otherwise, the margin of error may be bigger than the actual difference in performance, which will produce misleading results. In order to reduce the margin of error, it is crucial to do multiple applications and average the results. •	Performance differences show more clearly the higher the heat load is. 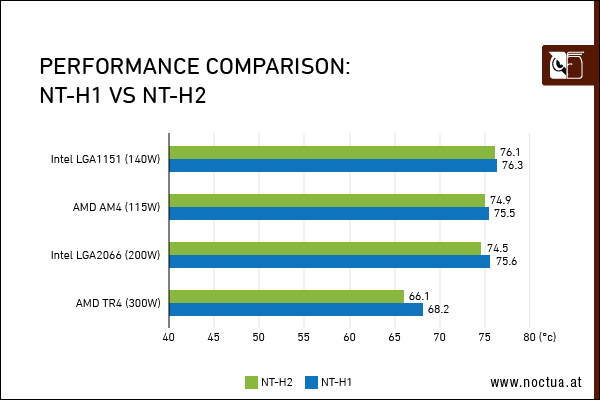 For example, the performance benefit of NT-H2 over NT-H1 may not show on a 65W processor, but will usually show very clearly on a 250W CPU. •	Performance differences show more clearly on larger CPUs than on smaller CPUs, e.g. they will be more pronounced on AMD TR4 (ca. 72x55mm) than on Intel LGA1151 (ca. 28x28mm). •	With current Intel CPUs there can be up to several degrees difference in full load temperatures between individual CPU cores (especially on CPUs with a high amount of cores). Often, these differences are due to internal tolerances of the processor and therefore cannot be attributed to uneven application of the thermal paste or poor heatsink contact.